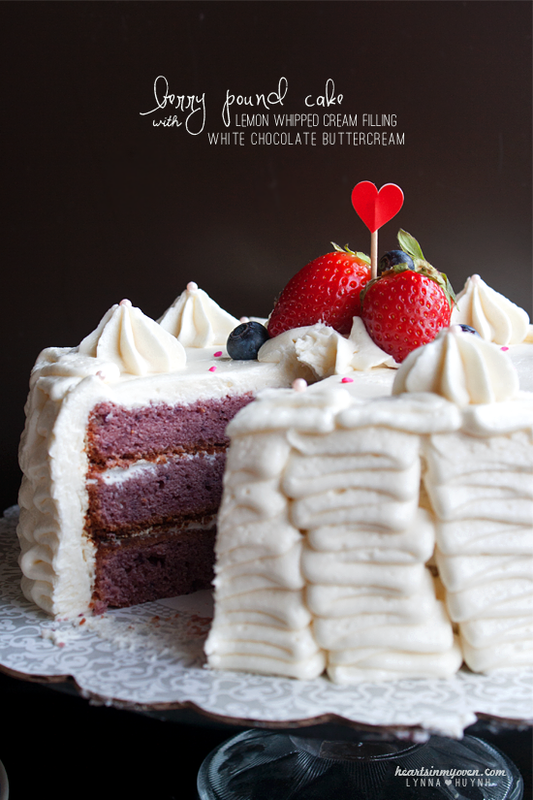 Hearts in My Oven: Berry Pound Cake w/ White Chocolate Buttercream + 2nd Blogiversary! Berry Pound Cake w/ White Chocolate Buttercream + 2nd Blogiversary! Whoa. How has it been TWO years since I started Hearts In My Oven? Tomorrow, March 29th, will mark my 2nd Blogiversary!! Thank you for following along! ♥ Wow. I remembered how long I hesitated with the idea of starting a food blog. One day, I just did it. I was motivated, excited, nervous and scared. But, I`m eternally grateful I did. I think this little blog has become one of my greatest accomplishments. To celebrate this wonderful occasion, I had to bake a cake! Not just any simple cake, but a 3 layered cake. I posted a photo of the cake last week on my Instagram and my friends' reactions made me chuckle. Hehe. Last year, when I celebrated my first blogiversary, I baked this lemon pound cake with strawberry and lemon buttercream frosting. I thought I should bake another cake this year, too. There are thousands of food blogs who make layered cakes on a regular basis, but not me. The serving size for cakes like these are too much for me to make often. As you can tell, my cake frosting needs some work. This is my third layered cake, ever, so please excuse the terrible piping. I see all of these GORGEOUS frosting tutorials online and felt that this was my perfect chance to practice. My first layered cake was for my dad`s birthday. I used a cake comb to decorate the outside since I didn`t have enough frosting. My second attempt was the lemon pound cake last year. I`m mentally kicking myself, because I don`t know why I didn`t take the opportunity to practice frosting!! But, wow. This cake did NOT disappoint! 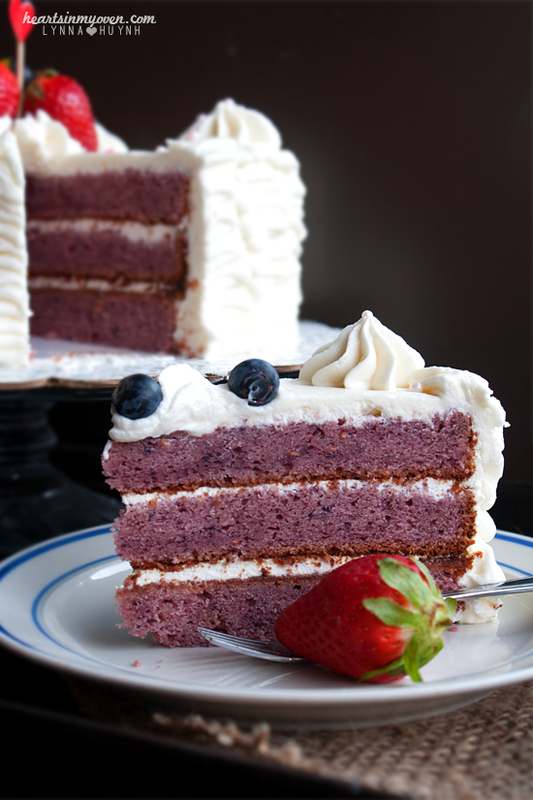 The cake has this wonderful berry flavor from all the real berries you incorporate into the batter. The purple color of the cake makes for a gorgeous presentation. 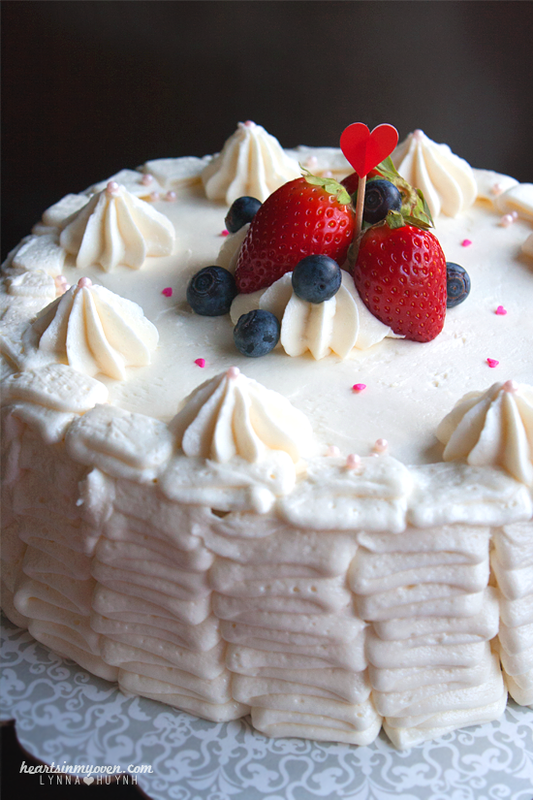 I paired the cake with a white chocolate buttercream, because berries + white chocolate = amazingness. 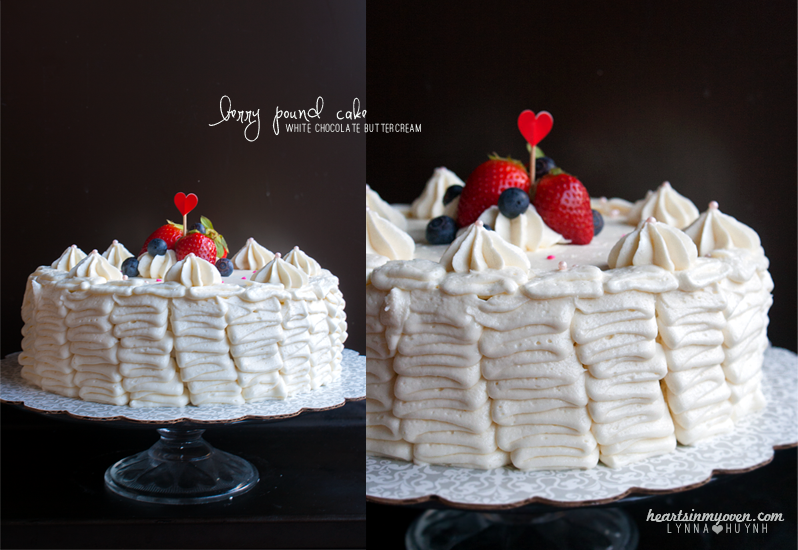 ;) I made this light lemon whipped cream to fill each cake layer since I didn`t want the cake to be too sweet. This may be odd, coming from a sweets person, but, I`m one of those people who take a good chunk of the frosting off cakes and cupcakes when I eat them. Most frostings are just too sweet for me. Haha! Anyways, this cake tastes amazing, people!!! It took me two days to finish this cake. I baked the cake layers first, leveled the cakes, and froze them overnight. This helps with loose crumbs. The second day, I whipped up the filling and frosting and then frosted the cake. After I leveled the cakes and took my first bite, I knew it was a winner. I kept eating the cake scraps on the first day because I just couldn`t wait until it was frosted. My mom, who`s not even a fan of cakes, kept saying she was in love with the berry cake. My friends told me was they loved it, too! 1. Preheat oven to 350°F. Line three 9 inch round pans with parchment paper, grease well. 2. Set a strainer over a measuring cup. Mash the frozen berries over the cup until you get 1 cup of juice. Save the mashed berries for later. 3. In a small saucepan, boil the juice from the berries until juice has reduced to ¼ cup. Remove from heat. 4. In a food processor, pulse the mashed berries until chopped. 5. Add the reduced berry juice and lemon juice to the mashed berries and pulse until blended. Set aside. 6. In a medium bowl, whisk flour, baking powder, and salt. Set aside. 7. In a bowl with electric mixer, beat the butter until light and fluffy. 8. Add the sugar and brown sugar and mix until incorporated and batter is smooth. 9. Add the eggs and egg yolks, one at a time, beating in between each addition. 10. Mix in ¾ cup of the berry mixture, vanilla extract, and food coloring until incorporated. 11. With the mixer on low speed: alternate between the flour mixture and milk, add the flour mixture 1 cup at a time and milk 2 tablespoons until incorporated. 12. Divide cake batter between the 3 cake pans. 13. Bake for 30-35 minutes, or until a toothpick inserted in the center comes out clean. 14. Allow cakes to cool in their pans for 30 minutes before flipping them out to cool completely on a cooling rack. 15. Place your mixing bowl and whisk attachment in the freezer for 15 minutes before beating. 16. Beat heavy cream until cream thickens slightly. 17. Add granulated sugar and beat until soft peaks. 18. Add in the lemon curd and beat until stiff peaks. 19. To assemble: Place the first cake layer with the bottom faced up. Place about 1/3 cup of whipped cream in the middle. Using an offset spatula, spread an even and thin layer on top. Place the next cake layer on top, with the bottom of the cake faced down. Spread another layer of whipped cream. Top with the last cake layer, bottom side of the cake faced up. Using the rest of the whipped cream, make a thin crumb coat layer on top and on the sides of the cake. Refrigerate cake so the crumb coat and harden. 20. Melt white chocolate in a microwavable bowl, in increments of 30-20 seconds until chocolate is melted, stirring in between. Set aside and let it cool. 21. In a bowl with an electric mixer, beat the butter and powdered sugar until light and fluffy. 22. Add in the heavy cream and vanilla extract. Beat slowly until incorporated. 23. Fold in the cooled, but still melted, white chocolate. 24. Beat the frosting on medium-high speed until fluffy (about 3-4 minutes). Add more powdered sugar, if you want to reach a thicker consistency. 25. To frost: Plop a dollop of buttercream on the top. Working from the top, to the sides, use an offset spatula to spread a thin layer of buttercream around the cake. 26. Use the rest of the frosting to pipe/decorate cake as you wish. If you want to make ruffles, use a teardrop shape tip. Transfer frosting into a decorating bag. With the bigger end facing into the cake, vertically, apply even pressure as you frost the side of the cake from bottom to top. Watch here: Youtube & view here. - I made the cake layers the day before I frosted the cakes. Once cake layers are completely cooled, wrap each layer with plastic wrap well, and freeze. You can do this ahead of time. - For the lemon whipped cream, you can definitely had 2-4 more tablespoons of lemon curd if you want a more tart/lemony taste, because the lemon taste is barely there when you eat a cake slice with the frosting. - For the buttercream, you can use a little bit more white chocolate if you wish. You can change up the amount of powdered sugar, to your match your own desire. For the ruffle technique I used: Watch here: Youtube & view here.